Samsung is trying to grab the mid range smartphone market for quite sometime and has gradually become pretty successful. The smartphone and electronic giant has managed to replace the Chinese companies and users are now diverting their attention from the Chinese market to much more stable products of Samsung. 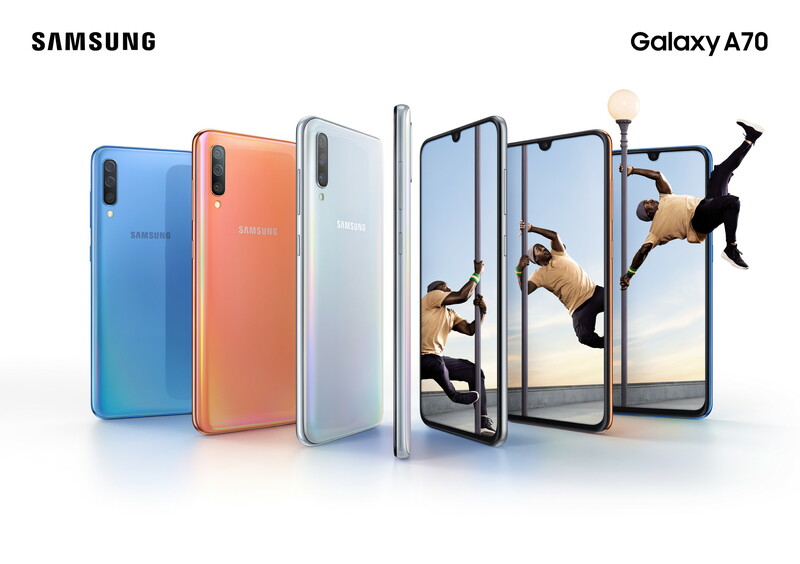 Following the appreciation, Samsung garnered for launching A30 and A50, the company has launched another handset called A70. Let’s have a sneak peek at the specifications of the Galaxy A70 device. It sports a 6.7-inch FHD+ (2400 x 1080) Super AMOLED screen with 20:9 aspect ratio for an amazing cinematic experience. In this handset also, Samsung has included the Infinity display, that is, a small semi circle notch at the top center position of the screen. Regarding storage, the device comes in two variants, 6 GB or 8GB of RAM. It has an on board storage option of 128GB, which is expandable by 512GB via a MicroSD card. A70 is powered by an Octa core processor. Other than that, we don’t know any more detail regarding the chip. The camera setup is quite commendable. It has a triple camera setup with 32 MP primary camera, 5 MP depth sensor camera and 8MP ultra wide sensor. It also sports a 32 MP selfie camera with f/2.0 aperture. The 4500 mAh battery is sufficient to meet your phone’s power need. Besides, the phone also supports ‘Super-Fast Charging’ up to 25W, which is even more powerful than the non-5G variants of Galaxy S10.